Over the past two years, universities and government agencies around the world, including the ATF in the U.S., have launched campaigns to inform the public how dangerous guns printed using Wilson's plans and thermoplastics are. Most recently, Britain's University of Warwick and the National Ballistics Intelligence Service (NABIS) said their tests showed the weapon suffering "catastrophic failures" that were more dangerous to the user than the intended target. Do you feel like many of these tests are rigged or that these testing entities are not following the same processes that you did in creating the gun? They didn't build it according to the way we built it, and then they'd report it as: "We built it and it blew up." It just wasn't accurate. I think it's because there's a rush to get a story, there's a rush to do the work. Have you partnered with gun rights groups like the NRA? No. The NRA doesn't like what we're doing. It's like they have no public statement even to this day even admitting we exist. There are some gun rights groups that you could call fellow travellers and we have a friendly relationship with. We haven't capitalized on the relationship. Have you felt push back from gun rights advocacy groups? The NRA is kind of a black box. I've heard there are supporters within and others who don't. The most opposition we've seen is from NRA members who really believe in institutional mediation of these thing. They like licenses and like background checks. And, you can understand that to a degree. How do you feel about background checks? I feel like it's part of a disciplinary fantasy. Like oh, we can know what everyone's doing. It's just kind of conceit of knowledge that I think is a fantasy. I think a realistic way of treating guns is not to do background checks before hand but to deal with actors afterwards. Is it a good business practice to rely on background checks? Yeah, sure. But I'm not playing that game. What are you doing these days? You graduated from college; you created Defense Distributed and the Liberator, are they your main focus or are there other interests? We just released a big piece of Bitcoin software with a group of anarchists in Spain. It's called the Dark Wallet. So how are you making money? Like I said, we did this big Bitcoin project and raised like six figures for that, and I have a book deal from Simon & Schuster. It's enough to keep me going right now. So your main focus is still enabling the 3D printing of guns and getting government approval to continue that? Yeah. I'm getting different kinds of government approval to continue my activity. I've got a problem with the State Department right now, but it's not as bad as it might seem. There's just a lot of apprehension and confusion about the technology and the means of its distribution. Can you explain why you're doing this? Is this all about the Right to Bear Arms under the Second Amendment? Gun people and Second Amendment people like the project, but for me it's really about the implications of open source and the digital age. It's global in scope. Cody Wilson demonstrating his 3D printed Liberator gun. 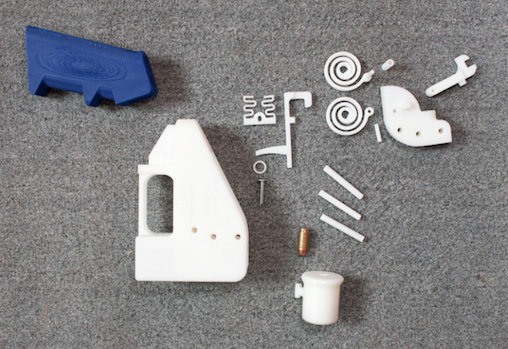 So, do you think there should be any regulations around the printing of 3D printed guns? No, I'm definitely not concerned with regulating it. In fact, I'm daring people to try. These 3D printers are general use technologies and software agnostic. It's been amazing watching the United States and other state and municipal governments try to deal with it. All we've seen so far is outright bans like in the city of Philadelphia. Well, that's not very useful and it's not going to work. What gun technology do you have planned for the future? We've got some interesting files, some new printing materials, but nothing I want to release until we've got more of a stable relationship with these regulators. I've got a super secret gun thing coming out in a couple months here. It's not necessarily a gun itself, but it should be pretty exciting for gun people.